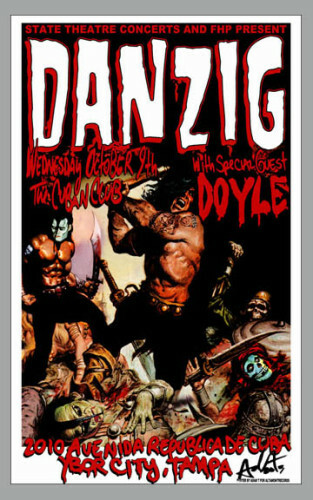 This is an extremely limited edition 11 x 17 gig poster printed on thick card stock designed by artist, Adam T. Commissioned by the promoter, this piece was issued to promote DANZIG’s show at the Cuban Club in Tampa, Florida. This is a beautiful poster that looks stunning framed. Signed by the artist and marked as “A/P” artist’s proof, only a limited number of this popular print remains. Postage is $5.95 in the USA, $19.95 International Priority.